Jahren has built three laboratories in which she's studied trees, flowers, seeds, and soil. She tells about her childhood in rural Minnesota with an uncompromising mother and a father who encouraged hours of play in his classroom's labs; about how she found a sanctuary in science, and the disappointments, triumphs and exhilarating discoveries of scientific work. Yet at the core of this book is the story of a relationship Jahren forged with Bill, who becomes her lab partner and best friend. Their sometimes rogue adventures in science take them over the Atlantic to the ever-light skies of the North Pole and to tropical Hawaii, where she and her lab currently make their home. With “Lab Girl,” Jahren has taken the form of the memoir and done something remarkable with it. She’s made the experience of reading the book mimic her own lived experience in a way that few writers are capable of. She swerves from observations about plant life (“A cactus doesn’t live in the desert because it likes the desert; it lives there because the desert hasn’t killed it yet”) to a report from the interior of her tortured brain (“Full-blown mania lets you see the other side of death”) to adventures on the road with Bill (“ ‘Do you really think this is illegal?’ I asked Bill over the CB radio.”) — and somehow, it all works, because the structure and the language follow the story. I read this book for the DeweyCat and found it also worked for memoir. Also discovered that this author is from Austen, Minnesota. I liked her writing and description of Minnesota but right off the bat, she exaggerates so keep that in mind when reading this. Winter does not start in September and last 9 months in Austen and it isn't that cold. Speaking as one from Northern Minnesota. I always say it can snow every month except July in Minnesota but really it isn't that bad and Austen in located nearly on the Iowa border. She describes a wonderful relationship with her father but for some reason must hate her mother even though they worked in the garden together. How can you hate your mother, she never gave us a good reason except she didn't think her mother showed love. She was okay with the stoic Norwegianess of her dad but disliked her mother. When she left home, she never looked back. She also reveals later in the book that she suffers from Bipolar illness. I suspect maybe a little personality disorder mixed in as well. She describes going through pregnancy with now medications. Perhaps, but I do think she made it more horrible than what it really should have been. What I liked. I liked the part about the plants and the science and how she "asks the questions" that lead to the research and the description of the difficulties of academia. Her lab partner was also eccentric. Pretty weird guy with great parents. I didn't get that either. And why didn't he complete his degrees. Usually colleges would have had some program for tuition of employees of the college. It's an easy read, entertaining and informative. Loved this quote, "Oh, I'm not worried about him," returned Bill. "He's gone (his father). It's not any more complicated than that. Honestly, if I admit it, it's me that I feel bad for." Really, that is what grief is. I also liked this; "We had them growing sweet potatoes under the greenhouse gas levels predicted for the next several years, the levels that we're likely to see if we, as a society, do nothing about carbon emissions. The potatoes grew bigger as carbon dioxide increased. this was not a surprise. We also saw that these big potatoes were less nutritious, much lower in protein content, no matter how much fertilizer we gave them." This memoir by a scientist, a botanist, was interesting for the most part. I enjoyed learning more about plant life, and felt a bit guilty while thinning seedlings in my vegetable garden. I absolutely hated reading about the gorilla in a roadside zoo-type attraction. I hate that the author went there. I hate that animals live decades in misery for our entertainment and the owners' profits. It seems that every time I read a memoir lately, it is about someone with mental health issues, someone who needs medication. While I am happy that the medication is helping, reading about it gets tiresome. I wanted to read about plants and the science thereof, and I got too much very personal information. Still, this was an interesting book. But my heart breaks for that gorilla and the others like him. Hmmm. Well, I liked some aspects of this one a whole lot better than others, but on the whole it was interesting and memorable. The parts of the book concerning the lives of plants are Wonderful. Really fascinating. The stuff about her work on soils is good too, but Jahren's gift for conveying her passion and enthusiasm for plants made this non-scientific reader, at least, feel “enlightened” and swept into an astonishing new world of familiar-but-unfamiliar living creatures, who act with an intentionality one never would have imagined. The stories of her lab and field work are captivating, the science beautifully explained, and the character of Bill, her heroically patient, deeply bizarre lab assistant, adds interest and also helps us see a more sympathetic side to our prickly narrator. The memoir sections, which form a substantial part of the book, are, for me, less enjoyable. Jahren, sensitive, self-absorbed, and arrogant, is not a character with whom I easily sympathize. I can well believe that the career of a woman scientist is particularly challenging, but Jahren goes on about the various injustices she faced at wearying length. Additionally, too much of the book is about her issues relating to her undemonstrative mother and her feelings of being “different.” She is a poster child for “special snowflake,” and, despite the genuineness of her challenges, especially her truly harrowing bouts of severe mental illness, I got more than a little tired of her woes. Towards the end of the book, however, the tone changes completely and my grumpy intention of giving this 3 stars (the skillful science writing itself deserves 4) disappeared. Her emergence as a loving, joyful mother, particularly, warmed my heart. Even in the most self-pitying parts of the book Jahren can be very funny, and she clearly acknowledges her own over-the-top drama. 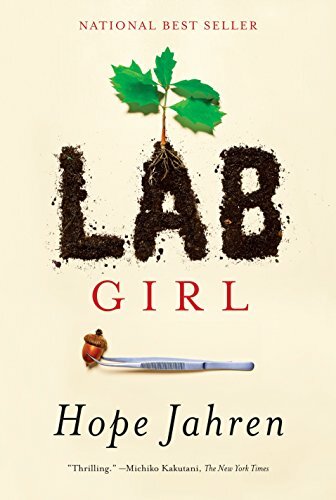 Lab Girl is a memoir/science-y book written by Hope Jahren, an award winning geobiologist. In the book she writes of both her career and personal life, and also gives a lot of information about the complex world of plant life. Jahren is a dedicated, inspiring, and talented individual, and her passion for what she does seeps through the pages. I admire her deep reverence for the natural world and her insatiable curiosity. I also appreciate her honesty in talking about her struggles with manic depression and all the doubts and setbacks she experienced along the way. Jahren writes a lot about Bill, her lab partner and best friend. They work together, travel together, and have done so for years, all while Jahren is happily married. I found their relationship intriguing, and like that it doesn't really fit neatly into any box. They obviously care about each other and that is what matters. Hope Jahren is a geobiologist, which, in her case, seems to involve doing a lot of studies on plants, and a lot of mass spectrometer experiments designed to figure out things about plants and their environments using isotope ratios. In Lab Girl, she talks about various aspects of her life and her career: growing up in a family who seldom spoke to each other; the painstaking care with which she goes about doing science and the careless neglect that seems to have characterized much of her personal life; the struggles of scientists to get funding and her particular difficulties as a woman in science; her struggles with bipolar disorder; her somewhat strange but very deep connection with her lab assistant/bff; her love of plants; and the ways in which she has grown in her life. She intersperses all of these personal musings with short, sometimes rather poetic descriptions of how plants grow and survive and reproduce. These chapters generally reflect in a metaphorical fashion on things in her own life, but she never pushes that so far it starts to feel artificial or cute. And they're kind of fascinating. I know they got me thinking in slightly new ways about the trees I pass every day on my way to work, almost without seeing them. 3.5 When I first started reading this I was more interested in the chapters, which alternated with her personal story, on the trees and plants. That changed though as I read on. Loved her story too, her beginning passion for the sciences, her childhood and going with her dad to his lab, her first jobs which I found eye opening, and her wonderful long term friendship with Bill. He would become her lab partner, the person she bounced ideas off of and shared triumphs and disappointments with. The truly difficult work of starting a new lab, the constant quest for funding, grants and other studies. Trying to formulate new experiments that would be found worthy of significant money. The many years of struggle, constant paperwork and the tweaking of ideas. The chapters on plants, trees and seeds were illuminating but sometimes a bit mind boggling.. still learned and immeasurable amount there too. I was blown away by the clarity of her writing, her passion, her vulnerability all of which shone through in this book. Her honesty with her doubts, mistakes and the hard work that this type of career entails. This is a book to reread there is so much information in it about the nature we see out of our windows and take for granted. She showed me a whole different way of looking at these things. Simple wonderful. As a former female scientist this book appealed to me even before I read it. Hope Jahren has a Ph.D. in soil science and has taught and run her own lab in three different institutions. On the other hand I only obtained a B.Sc., never did graduate work, never taught and always worked for some other scientist. So we don't have a lot in common but nevertheless I found her memoir fascinating. I listened to this book which was read by the author. I was drawn to this book after reading a short biographical sketch of Hope Jahren in Time magazine’s special edition of “The 100 Most Influential People.” I’d never heard of this prize-winning scientist before and wanted to know more about her. In the article, she was headlined as being “science’s great communicator.” That stunning phrase sold me: I just had to buy her book. There is nothing I love better than to read brilliant science authored by an accomplished academic who also writes eloquently. The book took me two days to finish and held my interest throughout. But in the end, the book was as equally fascinating as it was disappointing. It also left me frustrated. Let me explain. The memoir takes up perhaps two thirds of the text, but interspersed throughout are many small chapters, each illuminating some small facet of botany. Virtually every one of these life-science essays was exquisitely written and intellectually enchanting. I loved them! In many ways they reminded me of some of the best science writing of O. E. Wilson. I would definitely buy another book by Jahren that was focused on some popular aspect of geology, chemistry, or botany. These essays were five-star gems…but this book is not getting five stars because those essays only formed a minor part. As charmed as I was by the book’s botany essays, I was disenchanted (and frustrated) with the biographical chapters. In my view, all lives are fascinating if you scratch deep enough, and Jahren’s life was, indeed, very interesting. But what this author seemed to lack is any deep psychological perception about herself. In so many ways, Jahren seemed like a stranger to her own emotional and psychological landscape. I found that startlingly odd in a woman who was otherwise so incredibly brilliant. I always wanted her to take me deeper, but instead she generally just followed the action. Sometimes her vignettes were intriguing, sometimes amusing, sometimes downright silly (revealing youthful immaturity, lack of judgment, and inexperience)…and a few times, they were bit too technical for my general interest. Her memoir consisted of a disjointed grouping of chronological stories selected from her life. At the end, the author reveals that she had chosen most of the stories because she and her lab partner, Bill, often reminded each other about them and took great joy in talking about them. If these stories amused the two of them, she was sure they would amuse others…including the reading public. The stories come from the author’s day-to-day academic experience as a research geochemist and geobiologist. But taken together as a group, the stories actually celebrate the history of her extremely odd, two-decade-long relationship with her lab assistant, Bill. As a whole, the stories puzzled me more than they entertained or amused me…and by the end, the man and their relationship remained more of an enigma than anything else. Author Hope Jahren is a paleobotanist who, in this wonderful memoir, shares her life as a scientist. Her infectious enthusiasm comes through in every page. Chapters alternate between amazing stories of plants and her journey as a scientist. We see her pursuit of her studies and the difficulties and adventures in establishing a lab of her own as she fights for lab space and funding. It's also a story of a unique friendship as we see her relationship with her lab assistant Bill, also a dedicated researcher as well as a staunch supporter of her work. And finally, it's a story of her not just living with, but triumphing over her bipolar disorder. She shares her absolutely manic work hours as well as some details of her incredibly brutal pregnancy where she chose so go without medication until the third trimester in order to protect her unborn son. She weaves these subjects into one really fine whole, and although my review may seem choppy with all the subjects she manages to work in, the book certainly isn't. Hope Jahren is a scientist. Her specialty is paleobiology. She also has a strong passion and dedication to trees. In this terrific memoir, Jahren describes her early life in Minnesota and her growing fascination with nature and the art of discovery. She then discusses her rise through the scientific ranks, with all the various successes and pitfalls, that crop up, along the way. She is currently a professor of geobiology at the University of Hawaii. Jahren takes the reader through her personal life, dealing with a bipolar disorder and starting a family. She also happens to be a very good writer and she offsets the drier, scientific analysis, with clarity and dazzling prose. Amazing book - heard it on audio - read by the author. Highly, Highly recommend it - will never forget it. Beautiful prose, a strong voice, and passion for science. I will be happy to read anything else Hope Jahren writes. Made me want to plant a tree. Get prepared to plant a tree! A must read for anyone in--or aspiring to--a career in the earth sciences, as well as anyone who makes decisions regarding their funding. If you know any hopelessly discouraged researchers, you just found their Christmas gift. This is an exceptional book by the author - made even more amazing considering it is her first - not counting multiple scientific papers. Her lyrical, emotional, and insightful insights into the life of a true scientist are eye-opening and a joy to read. This is one I will be recommending to everyone. Stunning science writing about plant biology interspersed with memoirs of a career in science. A book I'd like to give to all the young women I know starting on a research career; both inspiring and sobering. Yes, as her website says, she sure can write. "We were interrupted by a good natured offer from a drunkish student who was dangerously armed with a guitar." "Within certain social circles of the married, a single women over the age of 30 inspires compassion similar to that bestowed upon a big friendly stray dog.